We are privileged to be part of the team that worked in collaboration with the New York Power Authority (NYPA), City of Buffalo and several stakeholders to develop the Buffalo Energy Plan. 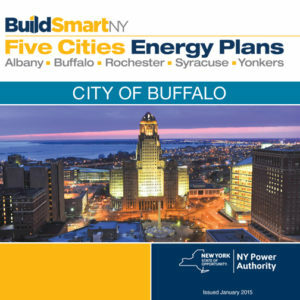 The City of Buffalo was one of five cities in New York State targeted to develop comprehensive energy plans for reduced energy consumption. Also participating in the Five Cities Energy Plans are Albany, Rochester, Syracuse and Yonkers. An initiative that builds upon the BuildSmart NY program established by Governor Cuomo in 2011, the Buffalo Energy Plan developed strategies and initiatives designed to reduce municipal energy consumption and energy costs; advance energy resiliency and innovative energy solutions; and support green industries and jobs. The Plan will reduce the City’s carbon footprint with a goal of reducing energy usage in municipal buildings by 20 percent by 2020. Stakeholder engagement was a key element of Wendel Completes Buffalo Energy Plan in Collaboration with NYPAthe planning process, with participation from representatives across private, public, non for profit, and institutional sectors. Stakeholders include the Buffalo Niagara Manufacturing Alliance, Buffalo Niagara Medical Campus, Greater Buffalo Niagara Regional Transportation Council, National Grid, National Fuel, University at Buffalo, Erie Community College and People United for Sustainable Housing. While the focus of the Plan is to develop solutions the City can directly implement, it also includes strategies to reduce energy usage by residents and businesses. To view the plans in their entirety click here. Wendel and 3480 Group announce today that they have entered into a strategic alliance. Wendel is a nationally recognized design and construction firm providing services across the country. 3480 Group, founded by Fulton “Flip” Johnson and Thurman Thomas, is a project management company dedicated to the construction, telecommunications and oil/gas/energy industries. Key components of this agreement are centered on project collaboration, management, design and technology. An example would be improving K-12 learning environments in low income areas where students are falling behind. Wendel and 3480 Group will look for opportunities to integrate capabilities to create service offerings that extend into new and existing markets. 3480 Group’s involvement with telecommunications and broadband internet communications, combined with Wendel’s engineering and architectural design experience, provides a natural progression for collaboration to accommodate the future evolution of our client’s infrastructure needs.